Chris Borland: What a pick!!! Chris Borland is averaging 12.8 tackles per game since taking over as a starting inside linebacker five weeks ago. From Peter King's "Odell of a Catch"
San Francisco linebacker Chris Borland, for the fourth straight week, leading his team in tackles. What a pick by GM Trent Baalke. Tennessee linebacker and ex-Cat Avery Williamson, center, celebrated after sacking Pittsburgh's Ben Roethlisberger for an 8-yard loss Monday night. 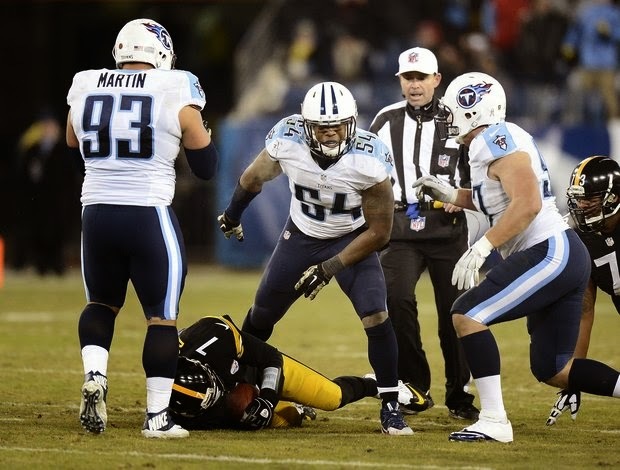 NASHVILLE, Tenn. – Titans linebacker Avery Williamson had a big game against a quarterback he's been watching for years, sacking Ben Roethlisberger not once, but twice. Now the rookie is working to make sure ego doesn't take his attention off the job at hand. "I'm happy with the way I've been playing," Williamson said. "Some plays I left on the field, but it's never going to be a perfect game. Just got to continue forward and progress each week. I'm definitely excited about my future, and I feel like it's going to keep getting better." So do the Titans with Williamson looking to be a steal as a fifth-round draft pick out of Kentucky. His success has been a bit overshadowed with three other rookies starting on offense. The linebacker from Milan, Tennessee, grew up a fan of the Titans, and he has played in every game this season. Williamson now has started the last six games, and he already ranks third on the team with 70 tackles. He easily is in position to top Alterraun Verner's 103 tackles in 2010 for most tackles by a rookie since 1999. Williamson also is tied for second with three sacks, and he has six quarterback pressures along with seven tackles for loss. "He's getting better and better every week," coach Ken Whisenhunt said. "I think his recognition of what he's seen on the other side of the ball, he's got a lot confidence in how he's playing. He doesn't make a lot of mistakes, which is unusual for a young player like that. He's grown up quickly. It's been a great asset to have him, especially after Zach got hurt earlier this year." The Titans lost Zach Brown a few plays into the season and tried to replace him with Zaviar Gooden. Despite not starting until the fifth game, Williamson currently is tied for third among NFL rookies in sacks and is second recovering two fumbles. Speed and hard work are Williamson's biggest strengths. Film study is one of the habits that helped the 6-foot-1, 236-pound linebacker as a team captain at Kentucky last season. Whisenhunt said the Titans really liked Williamson's maturity after four years in college and were impressed with him during pre-draft interviews. "Obviously, he loves football," Whisenhunt said. "I don't think you can ever anticipate that he would progress the way he did. You hope so, but it's been a real pleasant surprise." The Titans now trust the rookie enough that Williamson wears the helmet with the communication device hearing from coaches to get his defensive teammates lined up each play. But the Titans visit Philadelphia (7-3) on Sunday, and the Eagles' high-paced offense means defenses have to line up much more quickly than usual. So the Titans plan to help the rookie out by signaling in schemes from the sideline. "We're not putting it all on him," Titans defensive coordinator Ray Horton said. "We'll make a couple adjustments how we call the game so everybody will be responsible, not just him." That's fine with Williamson who just wants to help the team he grew up rooting for win. Taking time to savor everything he's doing will just have to wait until the offseason when he's back in Milan. "There's a lot of people really supporting me back home," Williamson said. The rookie linebacker is the first San Francisco 49ers rookie to win the weekly honor since defensive end Andre Carter won the award in 2011. Chris Borland took home the Week 11 prize for his 12-tackle, two-interception outing against the New York Giants. Borland, the 77th overall pick in the 2014 NFL Draft, was named Pepsi Rookie of the Week last week. He's now taken home another honor in just his fourth NFL start. Perhaps even more impressive, Borland, the former Big Ten Defensive Player of the Year at Wisconsin, is tied for San Francisco's team lead with 77 tackles, according to the count of the team's coaching staff. Borland picked off Eli Manning for his first career interception on Sunday. Twelve tackles later, Borland added a game-sealing interception after fellow rookie Dontae Johnson tipped Manning's fourth-and-goal pass into the air towards the rookie linebacker. Borland's been the talk of the 49ers in recent weeks. Teammates have praised his work ethic and overall contributions since he's filled in for perennial Pro Bowl linebacker Patrick Willis. Wednesday's award is an indication that the rookie is becoming a national conversation, too. You can also help Borland win a second straight NFC Rookie of the Week award by voting HERE. San Francisco 49ers' kicker Phil Dawson signals first down after the Kansas City Chiefs' were called for too many men on the field on a fourth down during Niners' 22-17 win during NFL game at Levi's Stadium in Santa Clara, Calif. on Sunday, October 5, 2014. After 13 productive years in the NFL, David Akers’ second season with the 49ers in 2012 was a disaster: The six-time Pro Bowler missed an NFL-high 13 field-goal attempts and was released in the offseason. Fortunately for the 49ers, recent history isn’t repeating itself. After 15 productive years in the NFL, Phil Dawson’s second season with the 49ers in 2014 has been, well, much like the others preceding it: The 10th-most accurate kicker in NFL history (84.4 percent) has made 82.6 percent of his kicks (19 of 23) this season. At 39, Akers is out of the NFL. At 39, Dawson is the second-oldest player in the league, behind the Colts’ Adam Vinatieri (41), and is showing signs he could join the Really Old Kickers Club. Morten Andersen (47), Gary Anderson (45), John Carney (45) and Eddie Murray (44) are among those who’ve kicked well into their 40s. How long does Dawson, who is signed through 2015, envision playing? “I don’t want to stay around if I’m just another guy,” he said. That’s not currently an issue for a kicker who, less than three months from his 40th birthday, appears to be pulling away from Father Time. Consider, for example, that Dawson has made a higher percentage of his kicks (87.3) since turning 36 than he did in his first 12 seasons (83.3). In addition, his right leg apparently has acquired bionic qualities: He has made 22 of 27 of field-goal tries from 50-plus yards since 2011, after opening his career 10 for-19 from that distance. Asked to account for such long-range excellence at an advanced age, Dawson discusses opportunity. That is, he wasn’t given many chances earlier in his career because he didn’t have a big-leg reputation. In addition, long attempts weren’t advisable late in the season in wintry and wind-swept Cleveland, where he spent his first 14 seasons. The 49ers would agree. 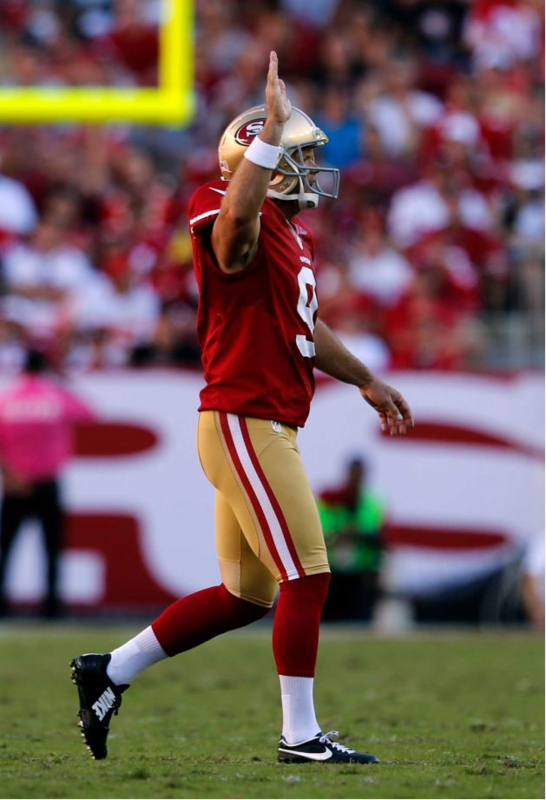 In his debut with the Niners in 2013, he set franchise records for consecutive field goals made (27) and longest postseason kick (49 yards), while ranking second all-time in points (140). This season has been more of the same for Dawson, who has the highest career field-goal percentage among kickers with at least 300 field goals made. He was named the NFC Special Teams Player of the Week for his 5-for-5 performance in a win over Kansas City, and two of his four misses have come from 51 and 55 yards. Another miss, a 45-yard attempt, wasn’t his fault: Some of the linemen failed to block because they didn’t realize a fake field goal had been called off. Dawson says he welcomes pressure situations, and his work with the 49ers suggests he’s the ice-water-in-his-veins type. He’s 4-for-4 on game-winning attempts with less than one minute left in regulation or in overtime. His last game-winner, a 35-yarder in a 27-24 overtime win over the Saints on Nov. 9, was the latest evidence that the NFL’s second-oldest man hasn’t lost his nerve. Chris Borland is going to force the San Francisco 49ers into a difficult personnel decision next year. The third-round rookie has racked up 47 tackles over the past three games. In Sunday's victory over the Giants, he became the first 49ers linebacker since Ken Norton Jr. in 1995 to record two interceptions in the same game. Despite starting just four games, Borland is second only to Luke Kuechly in Pro Football Focus' inside linebacker ratings for the season. He is even beginning to draw consideration for Defensive Rookie of the Year honors. "He's like a thief in the night," coach Jim Harbaugh beamed Monday, "coming to steal your football." Perhaps the most telling sign of Borland's value is that Vic Fangio's defense hasn't missed a beat with five-time first-team All-Pro Patrick Willis out of the lineup. The 2013 Big Ten Defensive Player of the Year set the conference record for career forced fumbles. He was a demon at the line of scrimmage during his Wisconsin career, but slid in the 2014 NFL Draftdue to size (5-foot-11) and straight-line speed (4.83 40-yard dash) concerns. What jumps off the screen on Game Rewind is that Borland boasts impeccable instincts, above-average power and better than expected closing speed, resulting in the best run-stop percentage in the league. "He's just dripping with instincts," NFL Media's Daniel Jeremiah explained Monday on NFL NOW's Scout's Eye. "We like to say in scouting, 'You really want a linebacker to shoot his gun and make a decision.' ... And he does that." If Borland has a weakness, it might eventually surface in man coverage. As Jeremiah points out, though, he has been impressive as a zone defender. With Willis out for the season, Borland is locked into the starting lineup through 2014. His 2015 role will hinge on All-Pro NaVorro Bowman's form in returning from reconstructive knee surgery the rest of the way. The bottom line is the total Borland package is too good to keep off the field. How the 49ers deal with that realization will be one of the many interesting stories to track out of the Bay Area during the offseason. 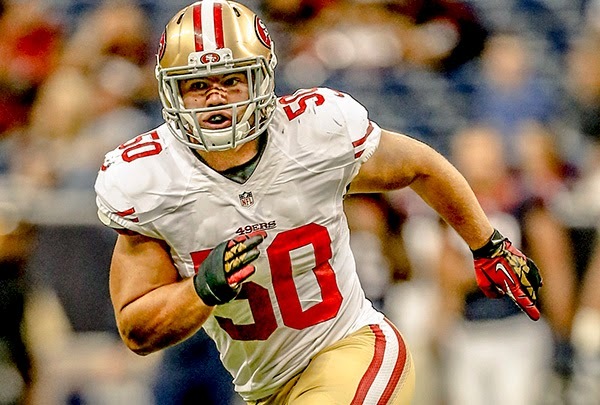 Rookie linebacker Chris Borland is a bona fide playmaker for the 49ers defense. 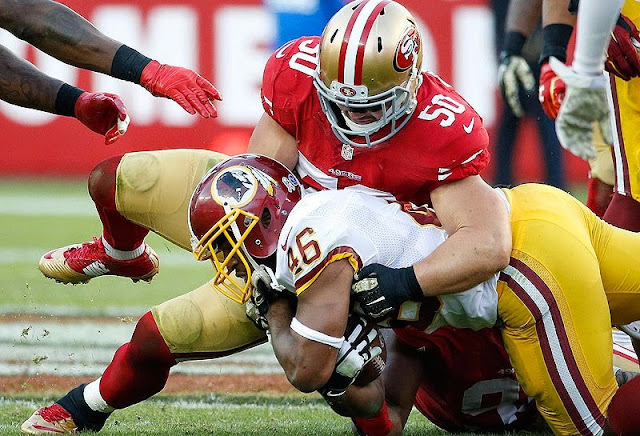 Rookie inside linebacker Chris Borland continues to show why he belongs in a starting role for what has been a beleaguered, yet effective, San Francisco 49ers defense. San Francisco's third-round pick has demonstrated this ability three weeks in a row—a much-needed aspect considering the 49ers will be without perennial Pro Bowler Patrick Willis as the latter recovers from a toe injury suffered in Week 6. Willis' injury has subsequently opened up the door for Borland. His first full contest came against the Denver Broncos in Week 7—a game in which San Francisco had little chance to shut down Peyton Manning and Denver's offense. But in Weeks 9 through 11, Borland has become not just a standout rookie but a stalwart in the 49ers defense. Who would have expected this out of a 6'0", 248-pound third-round pick? 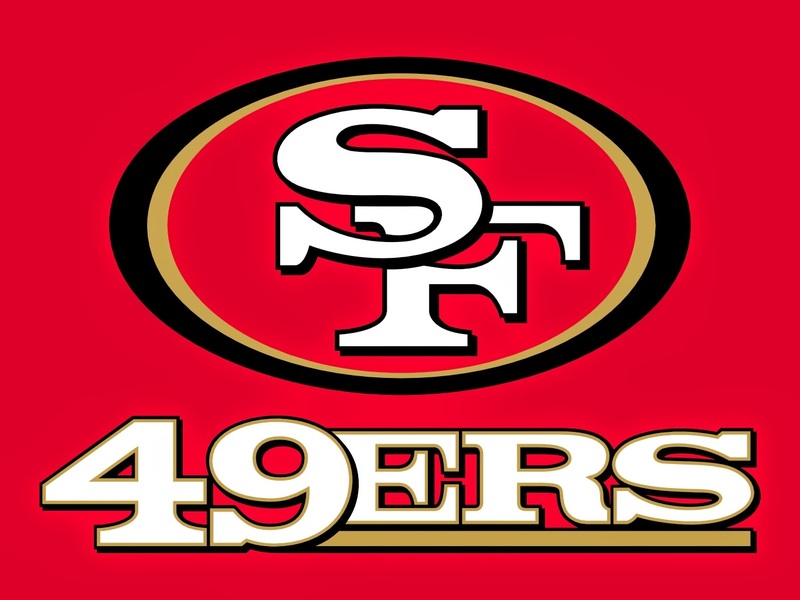 The loss of Willis could have spelled disaster for a 49ers defense that has already dealt with elongated absences of starters like linebackers NaVorro Bowman and Aldon Smith and cornerback Tramaine Brock. Borland has been a major factor in those statistics in the last three weeks. In Week 9, Borland amassed a team-leading 15 tackles and three assists in a 13-10 loss to the St. Louis Rams. A week later, Borland backed up his numbers with another 11 tackles and six assists against the New Orleans Saints. The rookie also jumped on an overtime fumble by Drew Brees that helped set up the game-winning field goal for San Francisco. It was after Week 10 when Willis was placed on injured reserve. With that news, Borland's role grew exponentially, as he is now expected to be a critical playmaker in San Francisco's stalwart defense. "I know he has many people in his family and has other people that are big fans of his," head coach Jim Harbaugh said via Daniel Brown of the San Jose Mercury News, "but I'm tied for at least his No. 1 fan." These back-to-back performances earned Borland two Rookie of the Week Awards, per 49ers.com. The rookie stands as the defending award recipient after last week. It's plausible that he could receive it again after Week 11. Prior to the 49ers' game against the Giants, no other player had as many tackles since Week 7, per NFL statistics (h/t Brown). Borland backed up that accolade with a 13-tackle performance against New York on Sunday—two of which were for a loss. While the tackles are impressive, the biggest element of Borland's game was felt when the inside linebacker was able to pick off quarterback Eli Manning twice. The second interception proved to be the most decisive. The Giants were in the 49ers' red zone late in the fourth quarter. A touchdown would have given New York a one-point lead. 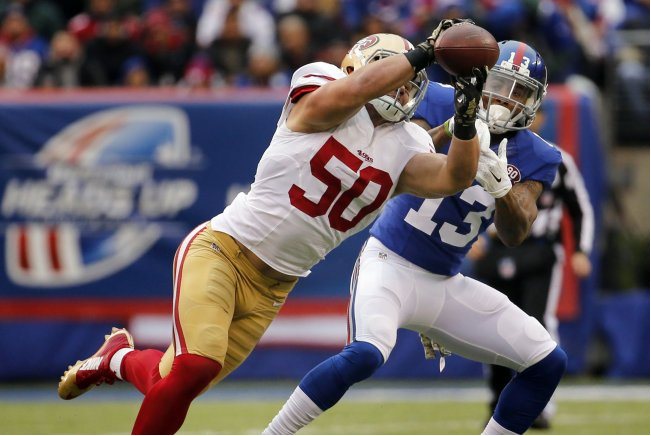 Borland's two interceptions were at key moments in San Francisco's 16-10 victory over New York. Tom Canavan of The Associated Press (h/t MSN.com) described what happened next: "Three fade patterns to Beckham, Rueben Randle and Donnell fell incomplete. Manning tried to force a pass to Preston Parker on fourth down, but Dontae Johnson tipped the ball and Borland came up with his second pick." With his second interception of the game, Borland now has done something that neither Willis nor Bowman have ever accomplished—two picks in a single game, per Taylor Price of 49ers.com. "The guy's playing out [of] his mind," noted 35-year-old veteran defensive end Justin Smith, via Eric Branch of SFGate.com. Borland is playing a high level of football. There isn't much doubting that. 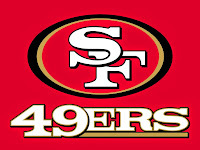 But the 49ers will hope that the rookie will continue performing at such a high level. He is emerging not just as a stopgap option in the middle of the defense but rather as an integral playmaker that bolsters an already formidable 49ers defense. With San Francisco looking to make a late playoff push, Borland will have to continue to be in the right place at the right time. He has lived up to this need, and there is little reason to suspect anything different moving forward. Backup running back Rex Burkhead only played six snaps on offense, but touched the football five times. He gained 37 yards from scrimmage and three first downs. If you're a fan of Rex Burkhead you're probably saying to yourself... finally. 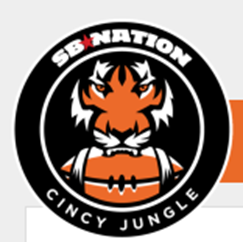 But, even if you're not an immediate fan of the player (or just indifferent), you're likely a Bengals fan who appreciates a good make-it-happen storyline. Cincinnati Bengals running back Rex Burkhead played six offensive snaps during Sunday's 27-10 win over the New Orleans Saints. And of those six snaps, Burkhead touched the ball five times for 37 yards from scrimmage (two carries, one yard... three receptions for 36 yards receiving). Essentially it was a career-day for the former sixth-rounder out of Nebraska, following up a 12-yard rushing effort last week against the Cleveland Browns. Burkhead was particularly effective in the passing game Sunday, converting a first on all three receptions. The first occurred after the defense's goalline stand. OK, while defensive players are selfishly (we're kidding) celebrating their game-changing accomplishment, the offense was tasked with a first down from their own two-yard line. After Burkhead picked up a one-yard gain on the ground, the Bengals had second and nine from their own three with 9:47 remaining in the second. Dalton faked the handoff to Burkhead, and then flipped the football out to his running back... who clearly had the advantage over linebacker David Hawthorne. Burkhead would show back up with 9:49 remaining in the third quarter. The Bengals had first down from midfield. Burkhead was flanking Dalton's right in formation while Ryan Hewitt went into motion, lining up wide left (and carrying linebacker David Hawthorne with him). Burkhead angled out to the 47-yard line, and cut upfield. Outside linebacker, Parys Haralson was covering. Dalton threw the football in front of Burkhead, who made a beautiful diving catch -- largely because he was losing his balance after a nice move against Haralson. The 10-yard gain picked up a first down. Despite bailing Cincinnati out from their own goalline and making an awesome reception, Burkhead made his most significant contribution a few plays later. 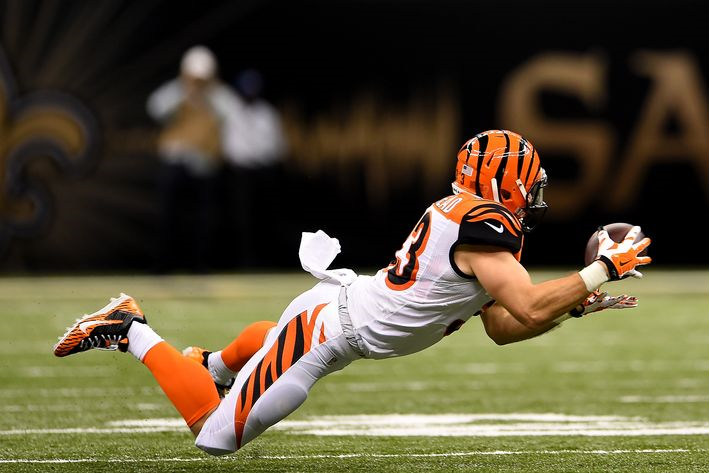 With 8:08 remaining in the third quarter, the Bengals had third and 11 from the Saints 41-yard line. After taking the shotgun snap, Dalton is flushed out of the pocket. Scrambling on an improvised bootleg to the right, Dalton found Rex Burkhead crossing along the 35-yard line. Needing six yards to convert the third down, Burkhead snagged the football and outpaced linebacker Curtis Lofton several yards after the first down was made. Not only did he get open for Dalton (nice throw on the run, by the way), Burkhead converted a third-and-11 situation with a 15-yard reception. This is important because the Bengals would eventually score a touchdown on this possession, taking a 20-3 lead with more than six minutes remaining in the third quarter. From Peter King's "The Perfect Patriot"
Seven things you need to know about this weekend. Chris Borland has 47 tackles over the last three games. Speaking of rookies, Borland also had two interceptions of Eli Manning. The 77th pick in the May draft is wedging his way into the Defensive Rookie of the Year sweepstakes. BALTIMORE, MD — If there’s one thing former Anamosa superstar Marshal Yanda hates, it’s talking about himself. When learning the national media was interested in speaking with him following the recent report he had been named the top offensive lineman in the NFL in the most recent rankings by Pro Football Focus, Yanda was appreciative, but cautious. “If they had questions about the team or how we’re doing as a group on the offensive end, those I could answer,” said Yanda, who is leading the Ravens through yet another solid season with a 6-4 overall record through 10 games. Yanda, who was in Anamosa this past summer during a ceremony having his jersey retired, as well as the high school weight room named in his honor, is enjoying another stellar season anchoring the Ravens offensive line. Yanda earned a 16.9 rating from the Pro Football Focus panel, blowing away the rest of the NFL field as no other offensive lineman had a score above 13.8. The former Raider and Iowa Hawkeye has also allowed just one sack this season. Chris Borland had a key overtime fumble recovery for the 49ers. From Nate Davis's "NFL Week 10 winners and losers"
Aaron Rodgers: He could have easily set the league's single-game record for TD passes (which would be eight) if the Packers had decided to truly embarrass the Bears. Instead, coach Mike McCarthy showed mercy to Chicago and pulled Rodgers and his six TD strikes, which all came before halftime, midway through the third quarter. Marshawn Lynch: If the Seahawks are going to release him into the free agent market during the offseason — Lynch is under contract through 2015 but has already expressed displeasure with his deal and is reportedly at odds with team management — the star running back continues to show he remains an attractive commodity after churning out 140 rushing yards and a career-high four TDs in Sunday's win over the Giants. Cardinals cornerbacks: With Arizona clinging to a 17-14 fourth-quarter lead and injured QB Carson Palmer in the locker room, star corners Patrick Peterson and Antonio Cromartie took over. On three consecutive Rams possessions, Peterson picked off two passes — he took the second 30 yards for a TD — before Cromartie scooped up an Austin Davis fumble and returned it 14 yards for another score. Arizona's 8-1 record remains the NFL's best. Gambling Cowboys: QB Tony Romo rewarded Dallas' risk to take him across the Atlantic, restoring balance to the offense with three TD passes despite his balky back, in a 31-17 victory over the Jaguars in London. Romo also managed to avoid further injury despite remaining on the field and taking some punishment late in the game even though the Cowboys were up 31-7 in the fourth quarter. Chris Borland: San Francisco's rookie inside linebacker had a huge game for a unit missing injured all-pros Patrick Willis and NaVorro Bowman. Borland piled up a game-best 17 tackles against the Saints and, most importantly, recovered QB Drew Brees' overtime fumble to set up the game-winning (and perhaps season-saving) field goal for the 49ers. Browns: From the comfort of their couches — Cleveland beat the Bengals on Thursday — they moved into sole possession of first place in the AFC North after the Steelers lost. The Browns, who are 6-3 for the first time in 20 years, could be primed to solidify their standing, too, as they host the Texans and newly named starting QB Ryan Mallett in Week 11 followed by a date with the struggling Falcons. Second-half Falcons: They broke a five-game losing streak, thanks largely to a strong finish, when they outscored the Buccaneers 14-7 after intermission. In the previous five games, Atlanta had been blitzed 85-38 after halftime. Matthew Stafford: On a day when Lions WR Calvin Johnson played for the first time in a month, the Detroit quarterback did a nice job spreading the ball around rather than maintaining radar lock on Megatron. Johnson and Golden Tate each exceeded 100 receiving yards and were both targeted at least 13 times by Stafford, whose best throw — a sidearmed, 11-yard, game-winning TD — was reserved for RB Theo Riddick in the corner of the end zone with 29 seconds to go. Michael Vick: He became the first quarterback to rush for more than 6,000 yards in a career. More importantly, his efficient, turnover-free play helped New York snap an eight-game losing streak, the worst of coach Rex Ryan's career. Carson Palmer's timing: The Cardinals quarterback secured his future in the desert after signing a three-year, $50 million contract extension Friday. NEW ORLEANS — There is a silver lining to the toe injury that sidelined All-Pro inside linebacker Patrick Willis for his third straight game Sunday: His absence has made it abundantly clear that the 49ers got a third-round steal when they selected Chris Borland in May. Subbing for Willis, Borland collected 17 tackles — two for losses — and recovered a fumble in a 27-24 overtime win against the Saints. After outside linebacker Ahmad Brooks sacked Drew Brees, Borland pounced on the loose ball. Phil Dawson delivered the game-winning field goal one play later. In his past two games, Borland has 35 tackles. His 18 tackles in a 13-10 loss to the Rams on Nov. 2 were the most in the NFL this season. Borland, 5-foot-11 and 248 pounds, slipped to the third round after a decorated career at Wisconsin because of his size and so-so speed. 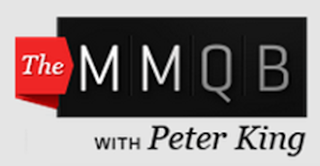 From Peter King's "Monday Morning Quarterback"
I lied when I promised I’d only give a max of two awards in any category. I cannot whittle down the defensive men from Week 10. Jaiquawn Jarrett, safety, New York Jets. The first of the anonymous Defensive Players of the Week, Jarrett came to the Jets in 2013, originally drafted by the Eagles in 2011 out of Temple. And Sunday, he had the best game of his short career—and one of the best games by any defensive player in the league this year. Ten tackles, a sack of Ben Roethlisberger, two interceptions of Roethlisberger, and a forced fumble. Jarrett was huge in a game where the Jets needed a great defensive day. It wasn't the prettiest game on earth, particularly from an offensive standpoint. The Steelers ran away from the Baltimore Ravens starting in the second quarter, fueled by a pass rush that appears to be more of a reality than a mirage. Leading that pass rush was veteran James Harrison, who was given a 4.8 grade from NFL plays evaluation web site Pro Football Focus in Pittsburgh's 43-23 win over the Baltimore Ravens Sunday. Harrison had two sacks in the game and made life miserable for Ravens quarterback Joe Flacco. Cameron Heyward was also frequently in the backfield, earning a 4.1 grade as the second-highest Steelers player graded in the game. Cornerback Antwon Blake received a 2.3 to round out the top scorers on defense. Outside linebacker Jason Worilds scored a -4.7, the only defensive player in the red for the Steelers. Offensively, despite scoring 43 points, PFF didn't view the Steelers' performance as particularly outstanding. Tight end Matt Spaeth had a heads-up release on a botched extra point in the first half that netted the two-point conversion on a throw from punter Brad Wing, as well as a nice catch on a late touchdown pass from Ben Roethlisberger. It earned him a 2.2 grade, the highest among the offensive players. Ben Roethlisberger scored a 2.1, joining Spaeth as the only two Steelers players to earn a positive grade higher than 2.0. The Steelers offensive line, Ramon Foster in particular (-4.8), had a rough outing only one week after performing quite well against the Colts. But it's understandable, given the talent level of their opponents. Tight end Heath Miller had a -2.1, the second-lowest offensive score. Pittsburgh moved to 6-3 on the season, and the mark of a good team is winning ugly. Generally, we agree with these scores (Foster was the lone member of the Losers list in our Winners and Losers column, and Harrison and Blake were on the Winners list. Honorable mention would have gone to Spaeth and Heyward). PFF does an initial grading, then revisits it later when all the film becomes available. We wouldn't expect these grades to drop or rise much, though. 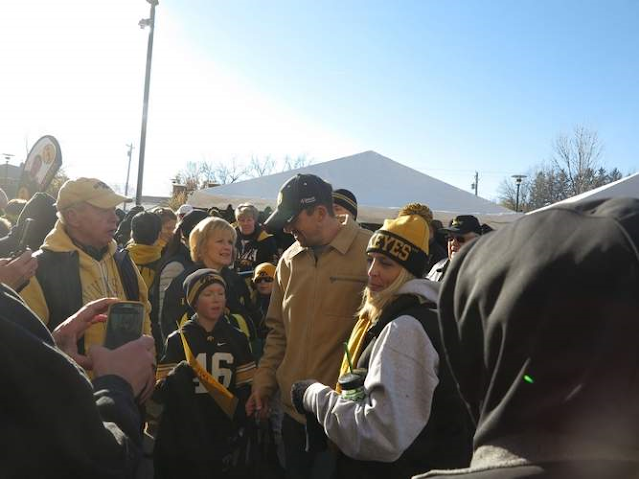 IOWA CITY — Dallas Clark was bombarded for autographs for nearly 90 minutes Saturday morning, and the former NFL tight end loved every minute of it. Clark, who retired this summer after 11 years, took pictures and signed everything from jerseys to towels with a smile on his face. The 35-year-old currently resides in Indianapolis but plans to relocate to his home area in north central Iowa. Clark was a first-team All-American at Iowa in 2002 and won the Mackey Award as the nation’s best tight end. Indianapolis drafted him in the first round of the 2003 draft, and he caught 505 passes for 5,665 yards and 53 touchdowns in his career. He played nine seasons in Indianapolis, one year for Tampa Bay and finished his career last year in Baltimore. He played in two Super Bowls and won one. Clark said he’s enjoying retirement but it was an adjustment. Clark left Iowa early to come out for the NFL draft but returned to school to earn his degree in early 2007. It just happened to coincide with the Colts’ Super Bowl championship that season.